Rendering courtesy of the Allegheny County Airport Authority. 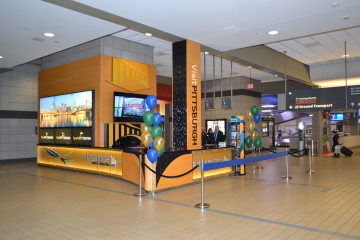 The sweeping redevelopment of Pittsburgh International Airport is ready to take off. On Wednesday morning, the Allegheny County Airport Authority unveiled the designs for its $1 billion Terminal Modernization Program. Although project engineers said that planning for the exact specifications will carry on through the summer, the design currently features additional space for an expanded TSA checkpoint, shorter walking distances for arriving and departing passengers, indoor and outdoor green plazas and gathering spaces with an overall emphasis on sustainability, and more automated systems. Designs by the architecture and engineering firms Gensler, HDR and luis vidal + architects incorporate elements inspired by the region’s natural environment as well as Pittsburgh’s industrial past and high-tech present. The Pittsburgh-based engineering and consulting firm Michael Baker International is advising on the project. Travelers can also expect additional space for concessions and artwork, including arts and crafts from makers and artists based in the Pittsburgh region. 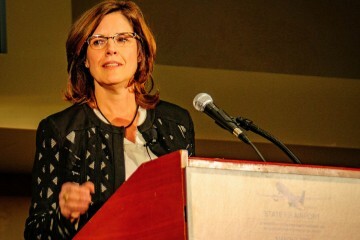 Artist and public art expert Renee Piechocki, who once headed the Office of Public Art in Pittsburgh, will consult on the art to be featured in the concourse. First announced in 2017, the Terminal Modernization Program is an ambitious redevelopment effort that will see the existing landside terminal demolished, and the current airside terminal remodeled into 51 gates. The new sections of the airside terminal will be built adjacent to the current airside facility between Concourses C and D.
Altogether, the project is slated to cost $1.1 billion, according to the Airport Authority. It will create 10,642 direct and indirect jobs, and generate $28 million in state and local income taxes. The budget for construction does not include any local tax dollars and will be financed through bonds, revenue from gas drilling, parking and retail. While the existing airport design was optimized for an era when the airport was a bustling hub for US Airways, Cassotis says the new design will emphasize a variety of carriers large and small. The terminal is expected to open in 2023. Check out a video detailing the ambitious project here.